Video Transfer. Most importantly all video transfers are NOT created equal! Our video transfer to DVD is among the best anywhere. Excellent playback gear and the gold standard Sonic MPEG-2 DVD encoder provide superior results. Our Sonic is the same encoder movie studios use to make their DVD masters. So you can expect excellent picture and sound. 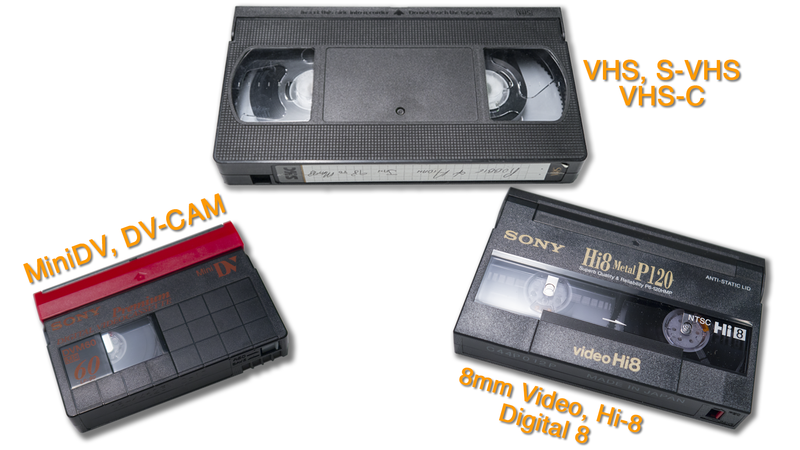 VHS to DVD, S-VHS to DVD, VHS-C to DVD, 8mm video to DVD, Hi8 video to DVD, Digital 8 video to DVD, and miniDV to DVD. A DVD is a DVD, right? They’re all the same, right? The discs look the same but the visual quality of transfers varies greatly! So you say “why does this matter”? Because virtually everything video is now viewed on High Definition displays. A mediocre video transfer is going to look WAY MORE mediocre in High Definition…that’s why! DVD transfers made on a DVD recorder (a VCR-like machine) or those first captured into video editing software and then transcoded into DVD? They simply PALE in comparison to the Sonic! DVD recorders also have a reputation for turning out DVD’s that don’t always play well on machines other than the ones that made them. Custom video transfer combines partially full tapes up to 120 minutes total. An additional $20 per tape is added to combine multiple tapes. This might save 15-20% versus one tape per DVD. The highest quality is obtained by limiting DVD content to 94 minutes. Editing—to select portions of a tape, to make different versions, plus other customization is available. Video transfer to hard drives, Blu-ray data, or flash drives for editing the video yourself on a computer. Content from non-commercial DVD’s can be extracted for editing. HD camcorder or phone footage can be made into Blu-ray video discs or DVDs. Video Transfer for media playback to or from foreign countries is available.